This e-guide will support you to heal your negative thinking and emotional patterns. It includes daily affirmations and 40 journal prompts to support you to birth your creative visions in the world. "This is fantastic Shelley as there's so much valuable info to absorb and process." ~ Patricia Evelyn - Kingston, Jamaica. This guidebook is for creators of all kinds - artists, creative coaches, therapists and facilitators who want to see their creative visions "made real" in the world. This e-book will teach you the universal principles of deliberate creation, and provides daily journal questions to support you to transform your self-doubt into creative confidence. As an emotion-focused therapist, I often like to invite people to heal stuck emotional patterns by envisioning a more inspiring future. Sometimes the best way to emotionally heal is to "live into" the highest possibilities for our lives. Even when our current circumstances are less than optimal, our future-self can "reach back" to help us heal. Our future-self offers hints about how to live our best life. We all have a nervous system driven "survival mind" that warns us about what might go wrong based on what hurt us in the past, And, we also have a "spiritual mind" that informs us of the highest potentials for our life. 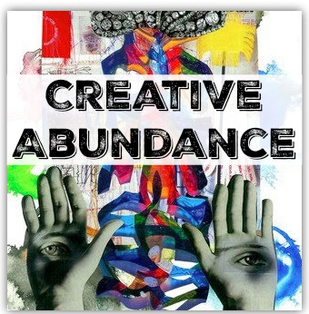 In "Creative Abundance" I invite you to spend more time in your "higher mind" instead of your "survival mind." I wrote this book during a time when I was struggling to believe in my own visions for my life. As a creative person, I had always imagined great things for myself, yet I was severely flagging in my confidence and was struggling with intense self-doubt. My creative imaginings had not yet shown up in my outer life and I was losing heart. This guidebook addresses the emotional side of deliberate creation. Each day, for 40 days, I welcome you to reflect upon the daily principle, and contemplate your questions for the day in your journal. This guidebook on deliberate creation will inspire you to focus on and attain what you want to create instead of creating your life from unconscious emotional pain from the past. 1. Think in unfamiliar ways so that your life can become more abundant. 2. Heal and process your emotional pain through written journaling. 3. Understand how to become emotionally allowing of good things. 4. Use deliberate creation to heal your present, past andfuture. 5. Work within your current circumstances to create higher thoughts to create prosperity. 6. Expand your creativity and abundance instead of recreating past emotional pain patterns. 7. Expand the boundaries of your belief in abundance. 8. Hold and enjoy heightened feelings in your body more consistently. 9. Access your visionary potentials and see beyond your present worries and limitations. Before taking this class, I was really struggling financially. My car broke down, and I was without transportation for months. I was overwhelmed by bills, and extra problems kept rolling in that required me to spend money. So I was quite stressed out while taking most of this class, and I often just read the daily lessons. I'm thrilled and amazed that in spite of my limited efforts, the book worked its magic on me! I'm not saying I suddenly experienced a huge financial windfall, but rather, an attitudinal shift that changed my views on abundance. Two weeks into the class, I was able to buy an affordable and dependable car from a friend. I also started keeping track of my spending. When I became more aware of my spending patterns, I quickly became more organized and mature with my income. This all happened in a beautiful, peaceful way, and continues day by day as I make more little shifts toward gratitude and abundance.